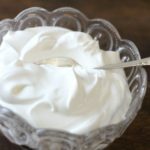 Enjoy this simple chantilly crème, a French classic that can be added to many cakes and pastries. Add ice and water to a large mixing bowl. Place a medium sized bowl inside the large bowl. Add cream and vanilla extract. Using a whisk or hand mixer, start beating the cream and then add confectioner's sugar. Whip until the mixture holds a stiff peak.